The most exciting game was a derby match between two local teams from Doha: Al Shamal (#2) and Al Gharafa (#6). Al Gharafa was defeated at home 67-82 and even the advantage of their own court did not help. Al Shamal dominated down low during the game scoring 48 of its points in the paint compared to Al Gharafa's 26. They looked well-organized offensively handing out 21 assists. It was a great evening for American guard Aaron Mitchell (188-89, college: Longwood) who led his team to a victory scoring 18 points, 5 rebounds and 5 assists. Algerian forward Mohamed Harath (198-90) helped adding 14 points and 11 rebounds. The best for the losing side was American guard Franklin Session (187-89, college: CS Los Angeles) with a double-double by scoring 24 points, 19 rebounds and 6 assists. Al Shamal have a solid series of four victories in a row. They keep a position of league leader. Al Gharafa at the other side keeps the sixth place with eight games lost. Al Shamal are looking forward to face Al Wakrah (#5) at home in the next round. Al Gharafa's supporters also look forward to another derby game next round, where their team will travel locally in Doha to the arena Al Rayyan. Another exciting game was again a derby between two teams from Doha: Al Arabi (#4) and Qatar Sports Club (#3). Al Arabi (9-6) won against visiting Qatar Sports Club (11-4) 76-70. It ended at the same time the two-game winning streak of Qatar Sports Club. It was an exceptional evening for American-Iraqi point guard Kevin Galloway (200-88, college: Texas Southern) who led the winners with a double-double by scoring 19 points, 9 rebounds, 11 assists and 4 blocks. Oumar Seck accounted for 16 points and 9 rebounds. American guard Jeff Newberry (188-92, college: Oklahoma St.) came up with 24 points and 8 rebounds for Qatar Sports Club in the defeat. Defending champion maintains fourth place with 9-6 record. Qatar Sports Club at the other side keeps the third position with four games lost. Al Arabi will have a break next round, and it should allow them to practice more before next game. Qatar Sports Club's supporters look forward to another derby game next round, where their team will face at home their local rival from Doha Al Sadd. Very important is a road loss of second ranked Al Sadd (11-3) against fifth ranked Al Wakrah (8-6) on Wednesday night. Visiting Al Sadd was defeated by Al Wakrah in Al Wakrah 83-72. It ended at the same time the four-game winning streak of Al Sadd. The best player for the winners was DaQuan Brooks who had a double-double by scoring 25 points and 10 assists. At the other side the best for losing team was Miroslav Todic who recorded a double-double by scoring 23 points, 11 rebounds and 7 assists. Al Wakrah maintains fifth place with 8-6 record. Loser Al Sadd keeps the second position with three games lost. Al Wakrah will meet league's leader Al Shamal in the next round and it will be quite challenging to get another victory. Al Sadd's supporters look forward to an exciting derby game next round, where their team will travel locally in Doha to the arena Qatar Sports Club. Bottom-ranked Al Rayyan managed to get a second victory, breaking the series of three consecutive losses. This time they won against eighth-ranked Al Khor 73-64. It was a good game for Lenny Daniel who led his team to a victory with a double-double by scoring 14 points and 13 rebounds. Al Rayyan (2-12) moved-up to eighth place. Al Khor lost ninth consecutive game. They dropped to the bottom position with 13 games lost. Al Rayyan's supporters look forward to an exciting derby game next round, where their team will face at home their local rival from Doha Al Gharafa. The most exciting game was a derby match between two local teams from Doha: Al Shamal (#2) and Al Gharafa (#6). Al Gharafa was defeated at home 67-82 and even the advantage of their own court did not help. Al Shamal dominated down low during the game scoring 48 of its points in the paint compared to Al Gharafa's 26. They looked well-organized offensively handing out 21 assists. It was a great evening for American guard Aaron Mitchell (188-89, college: Longwood) who led his team to a victory scoring 18 points, 5 rebounds and 5 assists. Algerian forward Mohamed Harath (198-90) helped adding 14 points and 11 rebounds. Five Al Shamal players scored in double figures. The best for the losing side was American guard Franklin Session (187-89, college: CS Los Angeles) with a double-double by scoring 24 points, 19 rebounds and 6 assists and the other American import forward Nick Stover (198-93, college: S.Alabama) produced a double-double by scoring 30 points and 12 rebounds. Al Shamal have a solid series of four victories in a row. They keep a position of league leader. Al Gharafa at the other side keeps the sixth place with eight games lost. Al Shamal are looking forward to face Al Wakrah (#5) at home in the next round. Al Gharafa's supporters also look forward to another derby game next round, where their team will travel locally in Doha to the arena Al Rayyan. Another exciting game was again a derby between two teams from Doha: Al Arabi (#4) and Qatar Sports Club (#3). 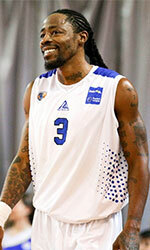 Al Arabi (9-6) won against visiting Qatar Sports Club (11-4) 76-70. It ended at the same time the two-game winning streak of Qatar Sports Club. Al Arabi made 16-of-21 charity shots (76.2 percent) during the game. It was an exceptional evening for American-Iraqi point guard Kevin Galloway (200-88, college: Texas Southern) who led the winners with a double-double by scoring 19 points, 9 rebounds, 11 assists and 4 blocks. Senegalese center Oumar Seck (208-88) accounted for 16 points and 9 rebounds for the winning side. Five Al Arabi players scored in double figures. American guard Jeff Newberry (188-92, college: Oklahoma St.) came up with 24 points and 8 rebounds and the other American import guard Kevin Bracy-Davis (201-95, college: Davis & Elkins) added 29 points and 5 rebounds respectively for Qatar Sports Club in the defeat. Defending champion maintains fourth place with 9-6 record. Qatar Sports Club at the other side keeps the third position with four games lost. Al Arabi will have a break next round, and it should allow them to practice more before next game. Qatar Sports Club's supporters look forward to another derby game next round, where their team will face at home their local rival from Doha Al Sadd. Very important is a road loss of second ranked Al Sadd (11-3) against fifth ranked Al Wakrah (8-6) on Wednesday night. Visiting Al Sadd was defeated by Al Wakrah in Al Wakrah 83-72. It ended at the same time the four-game winning streak of Al Sadd. The best player for the winners was American point guard DaQuan Brooks (177-90, college: W.Connecticut) who had a double-double by scoring 25 points and 10 assists. His fellow American import power forward Joshua Caldwell (203-91, college: William Penn, agency: SDJ Sports) chipped in 21 points and 4 assists. Caldwell is a former Eurobasket Summer League player, which is considered top international summer league in the market. Four Al Wakrah players scored in double figures. At the other side the best for losing team was Bosnian-Serbian power forward Miroslav Todic (205-85) who recorded a double-double by scoring 23 points, 11 rebounds and 7 assists and American point guard Dominic James (180-86, college: Marquette) added 14 points and 7 assists respectively. Al Wakrah maintains fifth place with 8-6 record. Loser Al Sadd keeps the second position with three games lost. Al Wakrah will meet league's leader Al Shamal in the next round and it will be quite challenging to get another victory. Al Sadd's supporters look forward to an exciting derby game next round, where their team will travel locally in Doha to the arena Qatar Sports Club. Bottom-ranked Al Rayyan managed to get a second victory, breaking the series of three consecutive losses. This time they won against eighth-ranked Al Khor 73-64. Al Rayyan forced 19 Al Khor turnovers. It was a good game for American Lenny Daniel (203-87, college: CS Northridge) who led his team to a victory with a double-double by scoring 14 points and 13 rebounds. His fellow American import guard Xavier Cannefax (188-89, college: Warner Pacific) contributed with 19 points and 4 steals for the winners. Cannefax is a former Eurobasket Summer League player, which is considered top summer league for players who want to play basketball overseas. Five Al Rayyan players scored in double figures. American point guard Ameer Jackson (193-94, college: Winston Salem) answered with a double-double by scoring 22 points, 13 rebounds, 5 assists and 4 steals and Aladji-Bobo Magassa added 20 points and 12 rebounds in the effort for Al Khor. Al Rayyan (2-12) moved-up to eighth place. Al Khor lost ninth consecutive game. They dropped to the bottom position with 13 games lost. Al Rayyan's supporters look forward to an exciting derby game next round, where their team will face at home their local rival from Doha Al Gharafa.